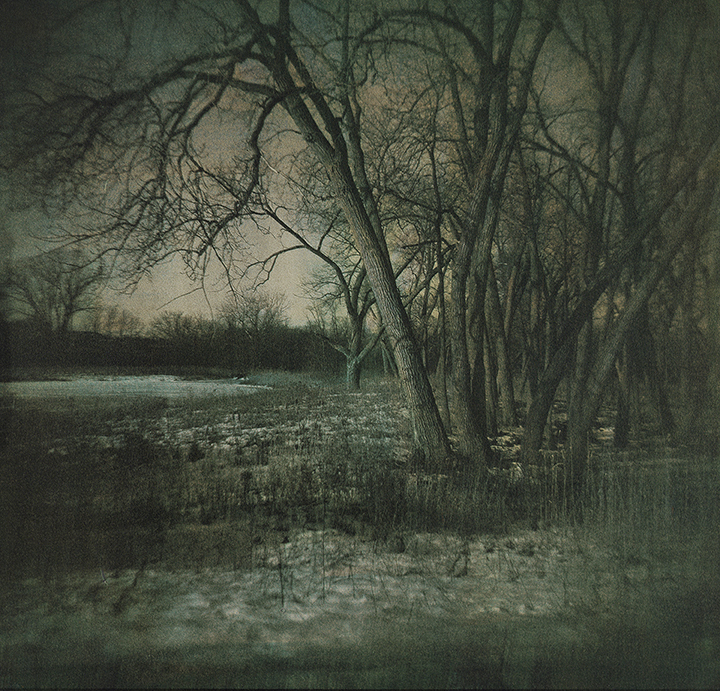 Visible Obscured, a solo exhibition of gum bichromate prints by Laurie Beck Peterson, explores the symbiotic relationship between process and subject matter. In the non-silver process of gum bichromate, the imagery develops through addition and subtraction. The process of repeatedly coating paper with different sensitized watercolor pigment colors, exposing them to sunlight and often brushing away the soft top layer to reveal the exposure beneath allows the ethereal layers to eventually coalesce into the final print. Forests, and the trees that compose them, emerge out of a similar dance of layering and revealing. The cambium of trees grows in rings, then divides to create new tissue. Some of this tissue dies each year to become part of outer bark. The trees themselves grow, die, and eventually become soil, out of which grows more trees. Layering and revealing, adding and subtracting, all play a role in this slow yet dynamic process. Both processes rely upon the energy of the sun to create physical form, be it a tree or a print. The centrality of sunlight is additionally emphasized within the work itself through a focus on compositional tonality. Certain formal and conceptual sensibilities that occur in this work are also present in my previous body of primarily figurative pieces. Figuration is central, whether the overt subject matter is trees or people. Light defines form. Color plays an integral role in creating mood. However, Visible Obscured represents to me a renewed commitment to “slow art.” That is to say, I work with the non-silver process expressly because it is tedious, laborious, and time-consuming, not in spite of these qualities. My subject matter, the woods and the trees, evolved over centuries. Mirroring and interpreting this process in an artistic manner affords me the opportunity to align myself with elemental forces of nature, to become a creator in the deepest sense of the word.